There were two other yachts close in to North West Bay on South Percy Island, but we anchored farther out in our usual 10 metres, which put us a good half a kilometre off but still out of the tidal race that runs between South Percy and nearby Middle Island to the north. After a meal and a rest, we chucked the tender over the side to go take a look at the beach. We considered rowing, but were aware of the three knot tidal rip and invisible reefs, so we clamped on the outboard instead. We spent a pleasant afternoon pottering about on the beach, after which Bronwyn sat down and sunned herself while I clambered about on the rocks and erosion gullies behind the tide line. Over breakfast next morning, we noticed the other two boats sailing out of the bay. It was only when Bronwyn said “Great! Now we have an island of our own!” that I realised that this was what I had been waiting for. Great Keppel had been nice, and I had been expecting to make use of the extensive hiking trails around it, but when it came down to it I’d been happy that we had gone snorkelling instead. Now we had the whole of South Percy Island to ourselves, and I had seen on my brief expedition the day before that there were no trails or paths at all. Perfect for exploring! We packed some vittals and took the tender over to the headland. We landed on a different beach which showed a few footprints and signs of human passage. Behind it was a pebbled gully full of flotsam, mainly timber and empty coconuts that must have floated in from Polynesian or Indonesian vessels, although there was an interesting pile of pumice on the high tide line. 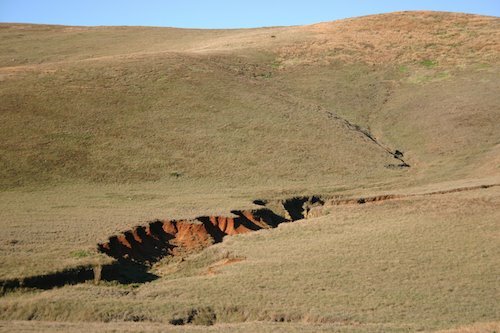 Above the gully, though, the green hills beckoned. I started the long climb to the top, and found it hard going. 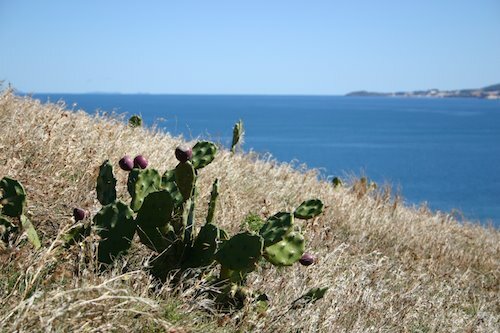 The tufty grass was ankle deep and crunchy, hiding rocky voids and small clumps of prickly pear cactus. This was excellent news, as it seemed to me pretty unlikely that most people would persevere, and I could continue my daydream of exploring a deserted tropical island. As is the way with these things, the top revealed another higher peak beyond, and then a third one. From there, though, I had a great view of the surrounding ocean and islands, and of the bay far below where Pindimara sat patiently at anchor. There were no trails or any other signs of human activity. I jumped up and down and waved to the little dot of Bronwyn far below, who years ago decided that I am a loony and best left alone in the presence of climbable peaks. 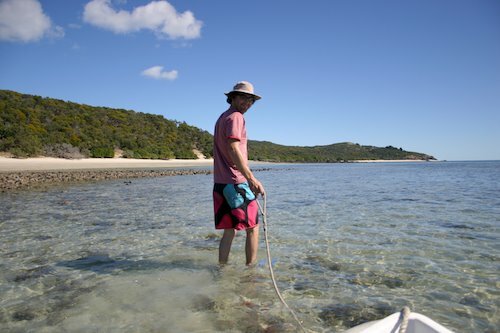 Later that day we decided to explore North West Beach, which looks like a great anchorage on the chart but which is described as having a difficult-to-see reef line. We went at low tide, in the tender. The tides here are four metres, and so at that time of day we could clearly see parts of the reef that you would normally only see when snorkelling or scuba diving. It was a curious feeling to be first motoring, then rowing, and finally walking along towing the dinghy through gardens of soft coral scattered with small fish and giant clams. I had to be very careful not to put my foot on anything that might get damaged, but it was an amazing experience. As the tide comes in over a reef, fish that have been hiding in rock pools or beneath the sand emerge and head out into deep water. We saw a few schools of fish milling around in the shallows waiting for their opportunity, and then suddenly realised that we were wading through the school of sharks that were waiting for them. We’re still not sure what species they were, but they were a metre long, brown with orange black-tipped dorsal fins, and very wide. They obviously detected that we were much bigger than them because they stayed at least five metres away, but it was still a weird experience to be paddling through a school of big and clearly very hungry sharks. This entry was posted in Australia, Oceania, Travel, Voyage of Pindimara and tagged Percy Islands, Sail on 2009/07/01 by Reinhard.